I happen to remember where I was when Superman "died." As a teenager, I was at a planning meeting for an organization I was involved in, and as it broke up, somebody noticed that it was past midnight, and thus the day of Superman's death had arrived. Not being a Superman fan specifically, I had been generally aware the the death of the Man of Steel was coming up, but I didn't know anything else beyond that. It was not until about a year or so later that I read the Death of Superman collection that followed his running battle with Doomsday. However, as our meeting was breaking up, there was suddenly a great deal of discussion about the big comic event that day. I got the impression that there was to have been some kind of midnight promotion event, but I am not sure what form it might have taken. (This was a bit before midnight premieres for highly anticipated movies, which seem to have begun in earnest with the Star Wars re-releases a few years later.) 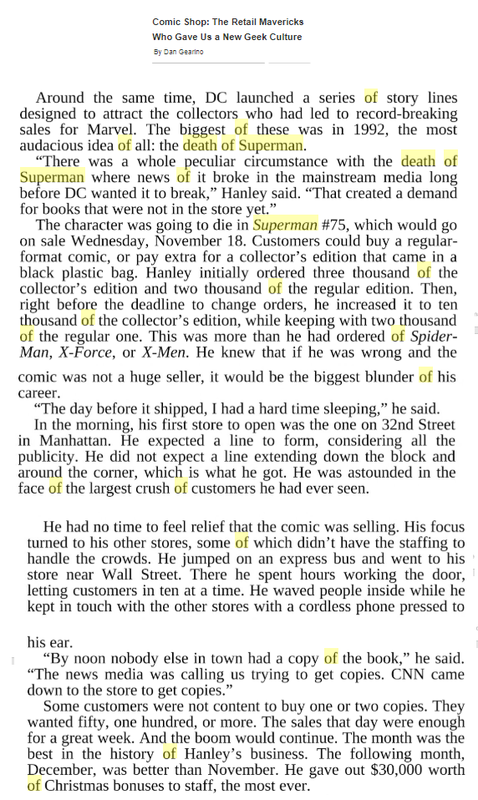 So was it just that comic book stores were going to be open at midnight to start selling Superman #75 that night, or was there a more elaborate midnight promotion? Browse other questions tagged dc superman or ask your own question. Are there official canon rules for DC comics superheroes, especially Superman? Why was Superman made practically physically invulnerable? When was Superman first mentioned in Literature? What caused the death of Superman? Can Superman Starve To Death? Death of Superman: what is Supergirl? When is Clark Kent's favorite story revealed? What is this comic in which Superman fights Death?